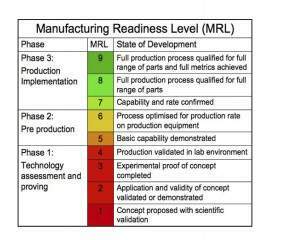 Manufacturing Readiness Level ("MRL") is a measure used by some United States government agencies and many of the world's major companies (and agencies) to assess the maturity of manufacturing readiness serving the same purpose as Technology Readiness Levels serve for technology readiness. They can be used in general industry assessments, or for more specific application in assessing capabilities of possible suppliers. The Government Accountability Office has described it as best practice for improving acquisition outcomes. The United States Department of Defense ("DOD") adopted the usage of MRLs in 2005, but the GAO continued to note inconsistent application across DOD components. In 2011, consideration of manufacturing readiness and related processes of potential contractors and subcontractors was made mandatory as part of the source selection process in major acquisition programs. MRLs are quantitative measures used to assess the maturity of a given technology, component or system from a manufacturing perspective. They are used to provide decision makers at all levels with a common understanding of the relative maturity and attendant risks associated with manufacturing technologies, products, and processes being considered. Manufacturing risk identification and management must begin at the earliest stages of technology development, and continue vigorously throughout each stage of a program’s life-cycles. 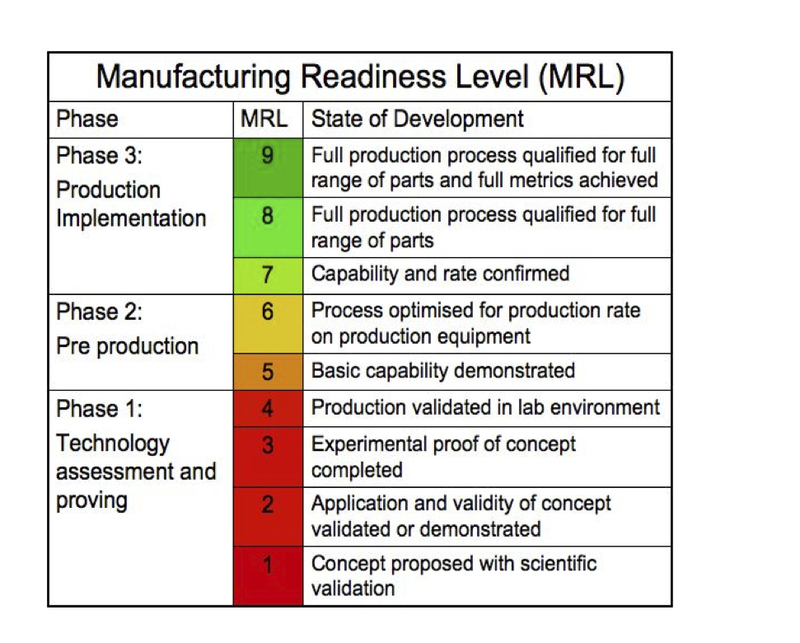 Manufacturing Readiness Level (MRL) definitions were developed by a joint DoD/industry working group under the sponsorship of the Joint Defense Manufacturing Technology Panel (JDMTP). The intent was to create a measurement scale that would serve the same purpose for manufacturing readiness as Technology Readiness Levels ("TRLs") serve for technology readiness – to provide a common metric and vocabulary for assessing and discussing manufacturing maturity, risk and readiness. MRLs were designed with a numbering system to be roughly congruent with comparable levels of TRLs for synergy and ease of understanding and use. • Manufacturing risk identification and management must begin at the earliest stages of technology development, and continue vigorously throughout each stage of a program’s life-cycle. • Matters of manufacturing readiness and producibility are as important to the successful development of a system as those of readiness and capabilities of the technologies intended for the system. • Is the level of performance reproducible? • What will these cost in production? • Can these be made in a production environment by someone without a PhD? • Are key materials and components available? Manufacturing Readiness Assessments (MRAs) address these unanswered questions in order to reduce manufacturing risk. However, it still does not address the question of whether the product is reliable or maintainable.